When I was asked to write an End Frame article, the first challenge was to narrow my choice down from a wide range of favourites to a single image. I suspect that like many of you I have several favourites, and often the choice depends on my mood, locations I’ve recently visited, or book I’ve been reading. I also wanted to write a thought provoking piece to leave you with something to take away after reading the article. Now, I haven’t tried this, but I suspect that if you asked the average man on the street to define landscape photography, he would tell you about images of mountains, rivers, the coast and countryside. He might cross the boundaries into nature photography, and just possibly into the abstract landscape genre. But in essence, these all have a rural theme to them. But does that mean that landscape photography should be limited to images made in the countryside? Now according to the 2011 census, while only 7.4% of England and Wales is classified as being Urban, this is still a sizeable amount of land. If the definition above is true, images made in this area wouldn’t be classed as Landscape Photography. So, is the definition correct? As you may have guessed by now, I don’t think it is. Being born and raised in the industrial West Riding of Yorkshire, my world was far from pastoral. We lived on the western edge of the Leeds/Bradford conurbation where the world of mills gave way to the moorland, however at that time I had little interest in photography. My choice of career took me to work on the railways. Now at that time the railways and coal mines were synonymous. A constant procession of coal trains fed the appetite of the Aire Valley power stations and my work took me to many of the pits instaling the rapid loading facilities. The thing which struck me at the time was how many of the collieries were in rural locations. You could drive for miles through open countryside and then come across a huge colliery complex, usually surrounded by its own village, seemingly dumped there from space. I was fascinated by these places, with the constant hum of industry and the massive scale of the buildings, all linked by conveyor belts moving coal endlessly from one place to another before depositing it into the railway waggons for onward transportation. Which brings me to my choice of photograph. All of the photographs in the project are in black and white, which I feel brings out the harsh environment of a colliery, or any other heavy industry, extremely well. Moving forward thirty years, I first became aware of the work of Chris Upton through a posting on social media. The post was promoting an exhibition of his work in connecting with the closure of Thoresby Colliery. I had a brief look at the images on line but never made it to the exhibition. A second chance came around at this year’s Photography Show, where Chris was giving a talk which coincided with the day I was visiting. The black and white prints Chris had on display were stunning. They portrayed the final months leading up to the closure of Thoresby Colliery in exactly the gritty realism I remember. All of the photographs in the project are in black and white, I feel brings out the harsh environment of a colliery, or any other heavy industry, extremely well. I’m sure that as colour images they would have been very nice, but wouldn’t have resonated as well. 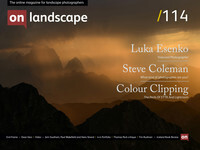 I could easily have chosen any of Chris’s images, but bearing in mind this is a magazine intended for landscape photographers, I decided to limit myself to the ones which could be loosely described as landscape. My choice in the end was Approaching Storm. On face value this is a fairly ordinary image of a colliery, but on closer examination there are quite a few subtle details. The three distinct groups of buildings, the headstocks, the coal preparation plant and the rapid loader, are all linked by a series of enclosed conveyor belts. Now as well as forming their intended purpose of transferring the coal from the point it emerges from the ground to the point at which it departs from site, these strong lines cleverly lead your eye around the image. They actually work in two directions, either front to back or back to front, and I don’t think it matters which way you go. Whilst the general atmosphere of the image is rather dark, the menacing clouds overhead add weight to the fact that the image was taken in the run up to the end of the mine’s life. In amongst the main structural features, there are other subtle reminders of the workings of a colliery. Parts of the preparation plant on the right have been demolished, an excavator is moving piles of coal waste around, and in the foreground there appears to be the compulsory deep black lagoon. Through all this though can be seen a hill in the background. Now it may be that this is just a slag heap, but I rather think that if you were to look at a colour original it would be green rather than black, which links nicely back to the point I made earlier about colliery’s often being in surprisingly sylvan locations. Whilst the general atmosphere of the image is rather dark, the menacing clouds overhead add weight to the fact that the image was taken in the run up to the end of the mine’s life. At some point all you can see will have been razed to the ground and returned to nature. Is it a landscape image or am I just on a nostalgia trip? I’ll let you decide but to me it’s both. A photograph of any type is by definition a moment in time past so the two are probably inexorably linked. A lot of our industrial landscape has slipped away over the years without being captured and I believe images such as this have just as much right to be thought of as landscape work as a mountain vista or seascape. Chris has an exhibition of prints from his Thoresby Colliery project at Nottingham Central Library from the 3rd to the 28th of May, to which I can highly recommend a visit. Alternately you can view his work on line work at http://www.chrisuptonphotography.com.